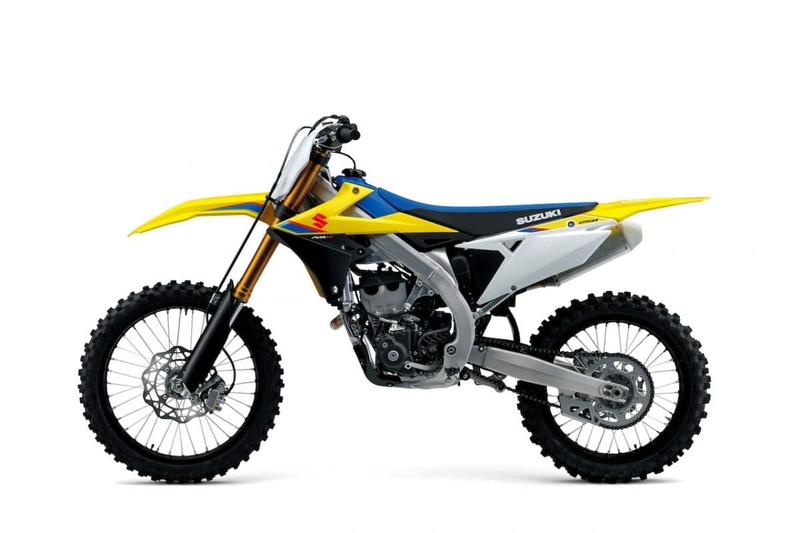 Suzuki has just released the all new 2019 RM-Z250. The bike features new styling, frame, KYB spring fork, updated power plant, and much more. Here is a closer look from Suzuki at their 2019 RM-Z250. The 250 class in motocross doesn’t forgive the slightest weakness. That’s why we’ve completely redesigned the all-new 2019 RM-Z250 to achieve the right balance of “Run, Turn, and Stop” necessary to win in this ultra-competitive arena. Intensive work by our engineers has once again made the RM-Z250 the leader out of the gate, with a new engine featuring increased power across the board and class-leading electronics, a lighter frame and swingarm plus updated suspension for even better handling, a completely new styling design, and a laundry list of other updates to make it the most potent motocrosser in its class. Look out…the 2019 RM-Z250 is here! All the power in the world won’t do any good if you can’t transfer it to the ground, and Suzuki’s innovative electronics work transparently with the rider for maximum acceleration on any type of dirt or track conditions. 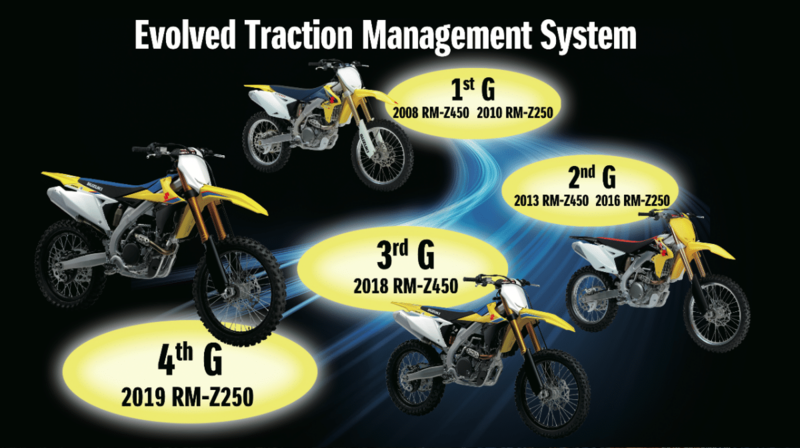 The 2018 RM-Z450 debuted the third-generation traction management system, with a significantly updated S-HAC (Suzuki Holeshot Assist Control) and more powerful ECM (engine control module). For 2019, Suzuki’s RM-Z250 goes another step further with the fourth-generation system featuring updated ECU software. The new RM-Z250’s S-HAC monitors throttle position and gear position in order to adjust ignition timing for maximum acceleration through the three critical stages of a motocross start: the exact moment of launch, getting over the starting gate, and then powering up the start straight. Three settings are available, with A- mode intended for harder surfaces where controlling wheelspin is paramount, B- mode for normal dirt conditions with good traction, and an “off” setting. Extracting maximum performance out of the RM-Z250’s powerplant entailed working on every detail possible. These include a 30% larger air filter intake aperture and straighter outlet to the throttle bodies for more airflow; redesigned cylinder head intake and exhaust ports that improved combustion efficiency and increased fuel pressure for enhanced fuel/air atomization; a direct throttle linkage for better feel. But our engineers didn’t stop there. The RM-Z250’s fuel injection system now features two injectors. 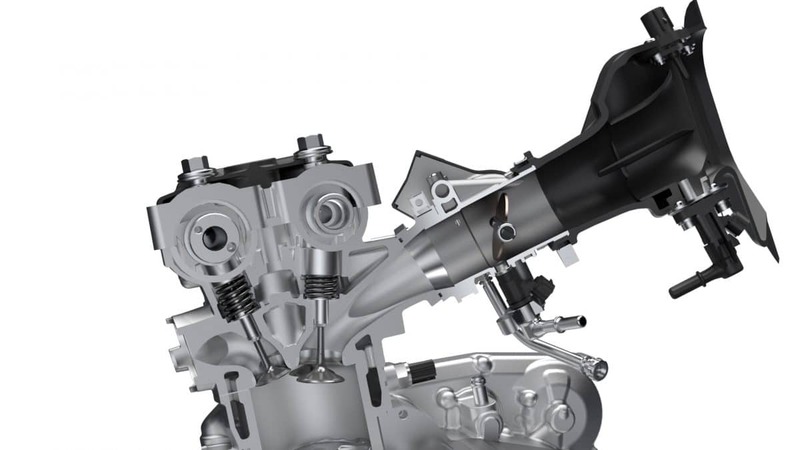 Instead of using a single injector that can compromise low-end fueling in order to supply enough fuel for top-end power, the primary injector delivers precise low-rpm fueling while a secondary injector at higher rpm provides the extra fuel needed. Plus, while the primary injector now sprays up at the throttle body butterfly valve for better atomization, the secondary injector’s location up near the air filter allows more time for atomization and cooling the incoming intake charge for more power. 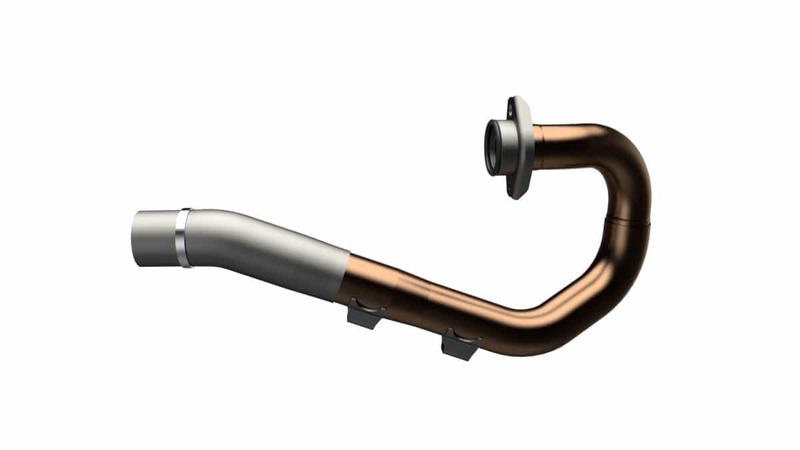 The exhaust pipe was lengthened by 99mm, with the internal diameter tapering from ø35mm at the cylinder head to ø45mm at the muffler. 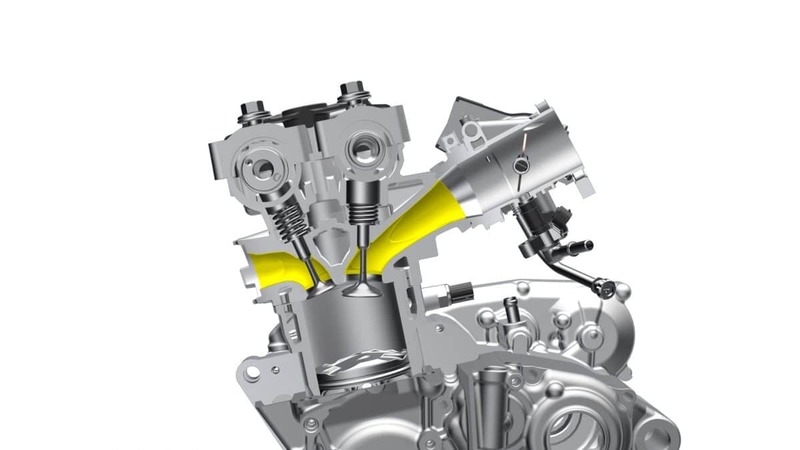 Piston durability was increased by conical machining of the wristpin bore ends to relieve stress on the piston crown. And in order to optimize acceleration, second gear was made taller, while the rear sprocket was enlarged to a 50-tooth from a 49-tooth unit. In keeping with the signature design started by the 2018 RM-Z450, the 2019 RM-Z250 maintains Suzuki’s distinctive “Beak DNA” styling. Intended to convey the brand’s heritage of speed in our off-road bikes, the front fender and radiator shroud are arranged to form a straight line, with the sharp and edgy angles expressing a feeling of dynamic speed. 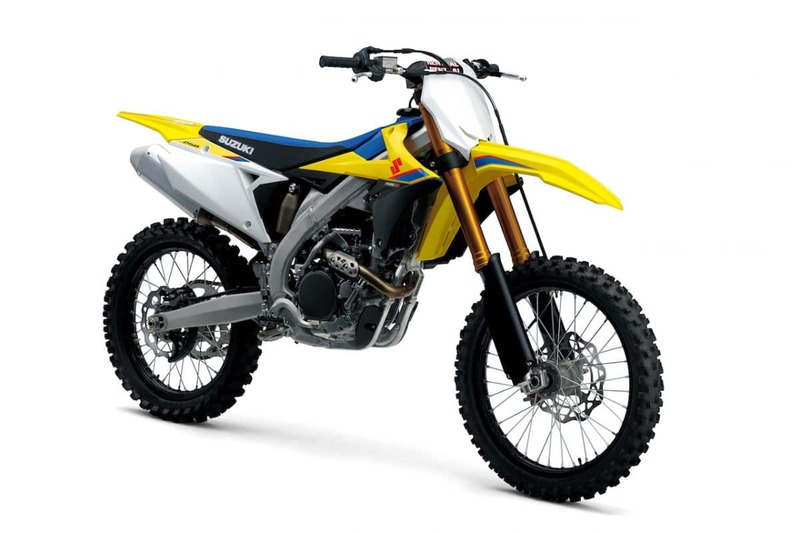 Like the RM-Z450, the 2019 RM-Z250 is finished in the Team Suzuki off-road colors of yellow with blue accents, making the RM-Z lineup easily recognizable. 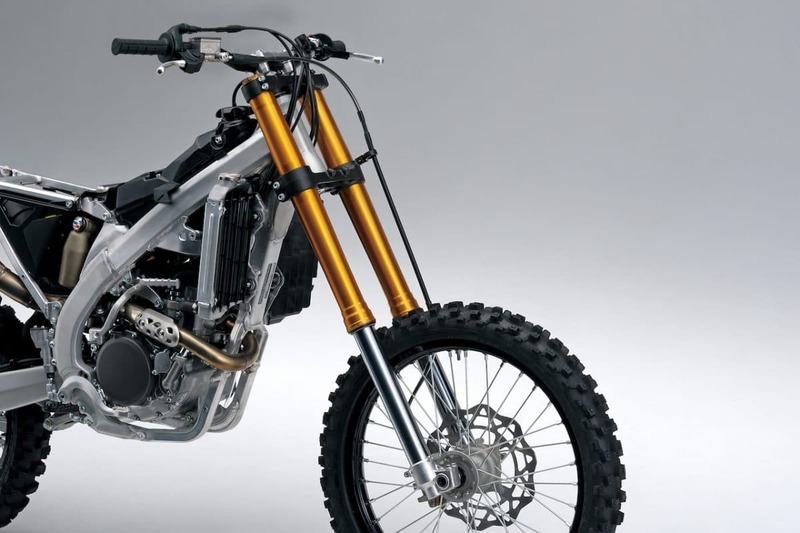 And the styling is functional, enabling the rider to shift weight forward or backward effortlessly, with the reduction in cover parts dropping 150.4 grams. The RM-Z250 is already known as one of the best-cornering motocross bikes available, but we went to work improving it even more for 2019. The frame and swingarm are all new, with the aluminum frame spars changing to a hollow square section that does away with an internal rib, shedding 370 grams while increasing torsional rigidity by 10 percent for better stability and bump absorption. 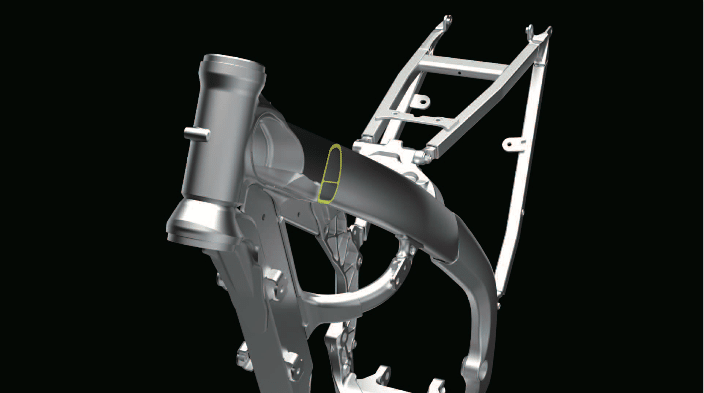 Using a new hydroforming process for the aluminum swingarm permits a tapered cross-section without any welding, making the new assembly just as rigid with thinner walls for a weight loss of 80grams. 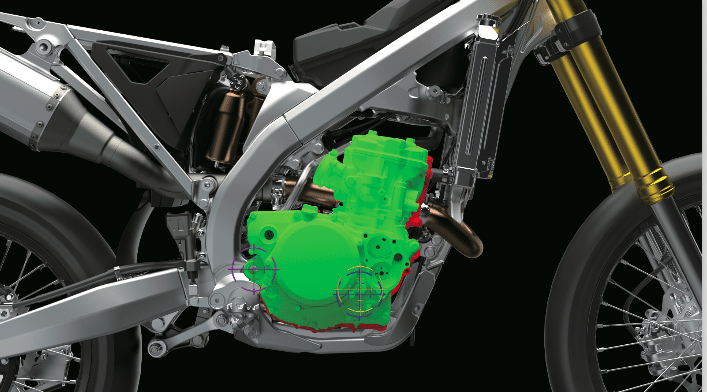 In order to increase the RM-Z250’s agility, the engine position was pivoted upward at the rear engine mount by 8.5mm measured at the crankshaft center. 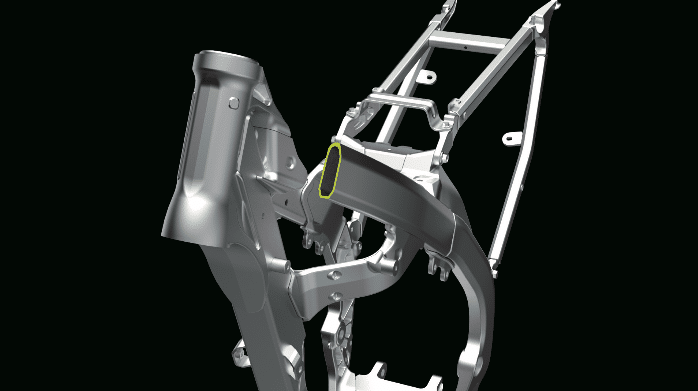 The upper engine mount brackets are now aluminum instead of steel, and rather than four brackets suspending the engine from a single location, the 2019 RM-Z250 has four brackets on both sides of the engine. This not only drops another 90 grams, but also increases overall rigidity. The seat rails (which are now hexagonal in cross-section to allow easier air filter access) have been moved closer together for a narrower midsection, while also being raised to ensure adequate airbox capacity. In order to take advantage of the new frame, the seat is all new, with its shape and foam density changed to allow easier movement, all while dropping 274 grams. The footpegs have been moved 3.3mm forward and 5.2mm upward, while the Renthal Fatbar tapered aluminum handlebar was repositioned 7.4mm forward and 3.8mm downward. The Renthal handlebar’s overall bend is also straighter than before to enable the rider to shift weight forward more easily. And the previous aluminum fuel tank has been changed to a resin-based unit, saving another 312 grams. The 250 class is all about maintaining momentum. This requires handling any and all track obstacles as quickly and efficiently as possible, meaning keeping the chassis stable and providing the rider with good track feel and feedback—without pounding him into submission. 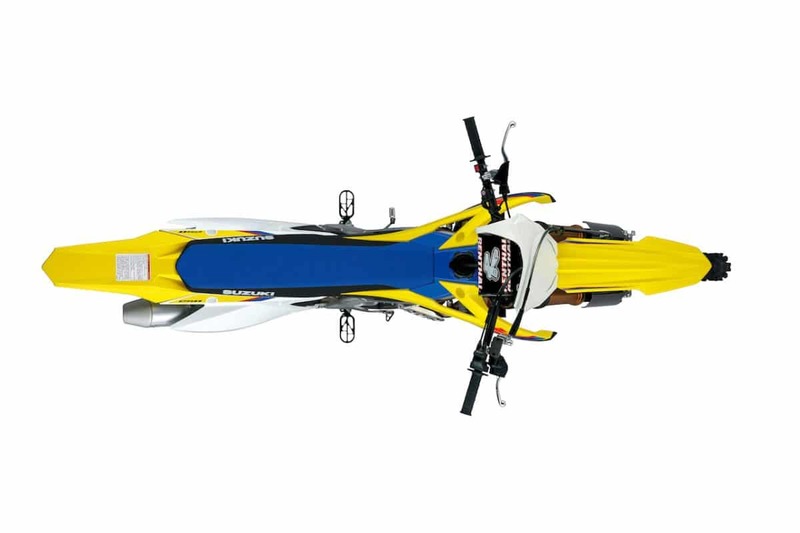 Whether it’s skipping over a big set of whoops, gassing it over a nasty rut- and pothole-filled straight, or landing from that big jump, the 2019 Suzuki RM-Z250 has you covered with an all-new KYB coil spring fork and redesigned rear shock and linkage. Replacing the previous adjustment-intensive PSF2 air spring fork from last year’s model, the new KYB coil spring fork features a unique design that provides a progressive damping setup offering excellent compliance over small bumps while firming up deeper into the stroke to handle bigger hits such as harsh jump landings. Upper and lower triple clamp design has been optimized for rigidity while cutting 60 grams. Out back, the rear suspension linkage ratio has been changed to firm up short stroke movement while optimizing longer suspension action for better traction, and is 14.9 grams lighter. The fully adjustable KYB shock has an improved range of adjustment, and a spring with thinner but stronger wire (feedbacked from MotoGP technology) that is 370 grams lighter than before. On an added note, the chain guide is a new design, with a shape that allows the chain to travel through it more evenly to improve durability, while also dropping another 30 grams. New lighter Dirtstar wheels reduce all-important rotating mass by 40 grams up front, and 60 grams in the rear. For 2019, the RM-Z250 will be fitted with Dunlop’s latest Geomax MX33 tire that has generated rave reviews, with an adaptive design intended for soft tracks that can perform well on medium, sand and mud racing surfaces, too. The 80/100-21 51M is used in front, and the 100/90-19 57M rear Dunlop is 300 grams lighter. And finally, all this added speed potential won’t help if you can’t keep the “Stop” portion of the performance triangle balanced, so we beefed up the RM-Z250’s front brake for 2019. 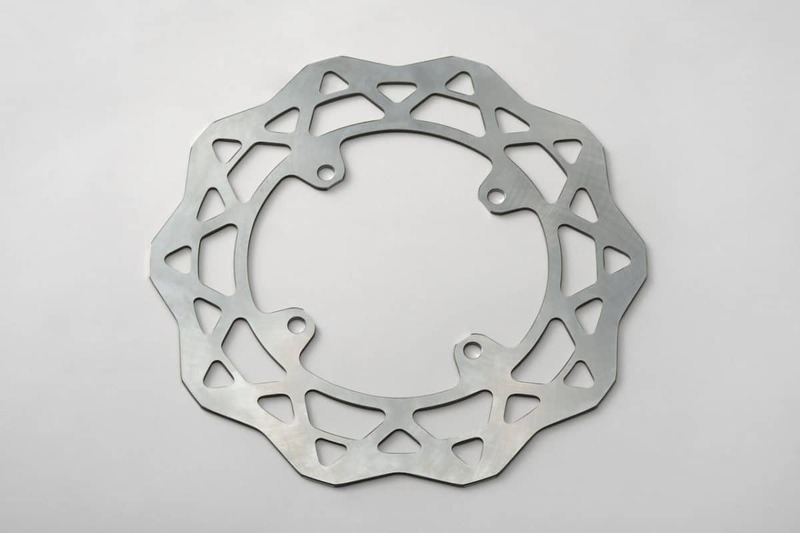 The disc diameter has been increased from 250mm to 270mm, and the brake pad material has been changed for more linear response characteristics as you brake harder.